What if you could harness the power of the free market to solve the problems of poverty, hunger, and inequality To some, it sounds impossible. But Dr. Muhammad Yunus is doing exactly that. As founder of Grameen Bank, Dr. Yunus pioneered microcredit, the innovative banking program that provides the poor " primarily women " with small loans they use to launch businesses and lift their families out of poverty. The success of Grameen Bank has been phenomenal and transformational. Today, it is a $2.5 billion banking enterprise in Bangladesh, while the microcredit model has spread to over 50 countries worldwide, from the U.S. to Papua New Guinea, Norway to Nepal. Ever optimistic, Dr. Yunus travels the globe spreading the belief that poverty can be eliminated: "...the poor, once economically empowered, are the most determined fighters in the battle to solve the population problem; end illiteracy; and live healthier, better lives. When policy makers finally realize that the poor are their partners, rather than bystanders or enemies, we will progress much faster that we do today." 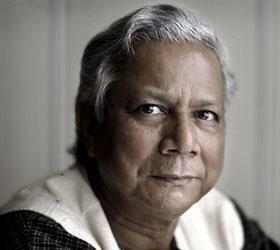 Dr. Yunus was awarded the Nobel Peace Prize in 2006 and the Presidential Medal of Freedom in 2009.